We are interested in cell–biomaterials interaction, and more specifically, on the dynamic formation of the provisional extracellular matrix (ECM) – the thin protein layer that cells recognize, produce, and remodel at the materials interface. Upon adsorption at material interfaces, proteins may assemble spontaneously and this interaction has significant consequences for their biological activity. The cells can also actively rearrange these proteins presumably as an attempt to organize a provisional ECM. We anticipate that materials that bind proteins loosely will support the arrangement of a provisional ECM, while stronger binding provokes its degradation, i.e. their proteolytic remodeling. ECM remodelling is a fundamental proces that occurs in various physiological and pathological conditions, such as normal development, wound healing and angiogenesis, but also in atherosclerosis, fibrosis, ischemic injury and cancer. It is dynamic and consists of two fundamental processes: assembly and degradation. Although matrix remodelling is a subject of extensive biomedical research, the way it is related to the biocompatibility of materials is poorly understood and is therefore a hot topic of our research. ECM organization at the biomaterial interface depends on the allowance of cells to rearrange adsorbed matrix proteins – a process strongly dependent on proper functioning of integrin receptors. We anticipate that materials that bind proteins loosely will support the arrangement of a provisional ECM, while stronger binding provokes its degradation. Upon adsorption at material interfaces, proteins may assemble spontaneously and this interaction has significant consequences for their biological response. Recently we have employed distinct silane-inspired chemistries and polymer compositions to create model substrates with tailored densities of -OH, -COOH, -NH2 and -CH3 groups, thus varying the chemistry, charge and hydrophilic/ hydrophobic balance. In a series of communications combining AFM and other nanoindentation techniques, we have described a novel phenomenon of substratum-driven protein assembly depicting the fate of various matrix proteins such as fibronectin, collagen IV, vitronectin and fibrinogen at the above model biomaterials interfaces. Specifically, we show that by varying the density of chemical functions one can tailor both the assembly and degradation of proteins. Following those findings we aim to control ECM remodelling by engineering specific material properties. Understanding the behavior of ECM proteins on flat biomaterials interface further boosts an important bioengineering target – the biohybrid organ technologies based on two-dimensional protein layers that mimic the arrangement of the natural basement membrane. Understanding the behavior of ECM proteins on flat biomaterials interface further boosts an important bioengineering target – the biohybrid organ technologies based on two-dimensional protein layers that mimic the arrangement of the natural basement membrane. With this project we aim to develop a synthetic basement membrane (BM) to be used as a supportive lining for cellularized implants, with specific focus on the design of a bioengineered blood vessel. Taking advantage of the self-assembly properties of the two principal components of the BM, laminin and collagen IV, composite matrices of these molecules are produced by mixing them before or during the polymerization of laminin under acidic conditions. Selected composites will be deposited on scaffolds produced using electronspun nanofibers preferentially made of polyethyl acrilate (PEA), which additionally favour networking of laminin and collagen IV. The resemblance to natural BM will be evaluated in terms of their morphological features and ability to properly induce the formation of biomimetic monolayers of endothelial cells. 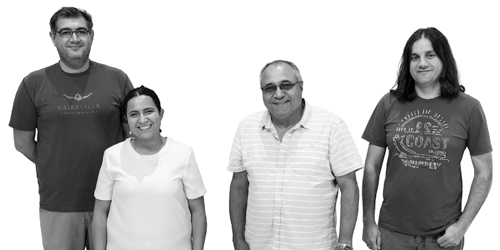 This project is driven involving joint efforts of our Lab and this of Prof Tatiana Coelho-Sampaio’s from the Federal University of Rio de Janeiro, Brazil. In solution, proteins can form structures of various shapes, including fibers with a diameter of only a few nanometers and with lengths up to centimeters. A fascinating possibility to mimic similar ECM structures is to engineer protein-like or matrix protein-containing nanofibers via electrospinning technology. For this purpose we are developing electrospun nanofibers from natural (e.g., fibrinogen) and synthetic polymers (e.g. PLA, PEA) in order to direct the desired cellular response via spatially organized cues (e.g. fiber size and geometrical organization) as well as by tailoring their chemical and mechanical properties. Examining hierarchical biology in only two dimensions (i.e., cells confined to a monolayer) is in most cases insufficient as cells typically exhibit unnatural behavior if excised from native three-dimensional (3D) tissues. Therefore, within the European FIBROGELNET project (under our coordination) we are developing 3D biohybrid constructs that combine the structural and biological properties of electrospun nanofibers with the optimized mechanical properties of specific hydrogels in order to provide stem cells with relevant spatial orientation in three dimensions. In addition to engineering the spatial configuration of cellular microenvironments, we are also interested in addressing the dynamic (i.e., temporal) aspects of the stem cell niche. To do that we take advantage of stimuli-responsive polymers to obtain control over an artificial cell-adhesive environment via dynamically altering either cell-cell (using cadherin-like ligands) or cell-matrix (using ECM proteins) interactions. By modulating the strength of adhesive protein-to-substratum interactions we aim to control the stem cell adhesive machinery, and which allows us to mimic the dynamic conditions of the stem cell niche. The two IBEC-led CIBER-BBN tissue regeneration projects that were earmarked for funding by the EU’s ERA-NET EuroNanoMed initiative last year (see here) have both received the national support they need to get started. A multidisciplinary research project coordinated at IBEC by group leader George Altankov has been selected for funding by the EU as part of the European-Latin American Network for Science and Technology (EULANEST). Extracellular matrix (ECM) proteins are key mediators of cell/material interactions. The surface density and conformation of these proteins adsorbed on the material surface influence cell adhesion and the cellular response. We have previously shown that subtle variations in surface chemistry lead to drastic changes in the conformation of adsorbed fibronectin (FN). On poly(ethyl acrylate) (PEA), FN unfolds and displays domains for cell adhesion and FN-FN interaction, whereas on poly(methyl acrylate) (PMA) â€“ with only one methyl group less â€“ FN remains globular as it is in solution. The effect of the strength of the protein/material interaction in cell response, and its relation to protein density and conformation, has received limited attention so far. In this work, we used FN-functionalized AFM cantilevers to evaluate, via force spectroscopy, the strength of interaction between fibronectin and the underlying polymer which controls FN conformation (PEA and PMA). We found that the strength of FN/PEA interaction is significantly higher than FN/PMA, which limits the mobility of FN layer on PEA, reduces the ability of cells to mechanically reorganize FN and then leads to enhanced proteolysis and degradation of the surrounding matrix with compromised cell viability. By contrast, both PEA and PMA support cell adhesion when FN density is increased and also in the presence of serum or other serum proteins, including vitronectin (VN) and bovine serum albumin (BSA), which provide a higher degree of mobility to the matrix. Statement of Significance: The identification of parameters influencing cell response is of paramount importance for the design of biomaterials that will act as synthetic scaffolds for cells to anchor, grow and, eventually, become specialised tissues. Cells interact with materials through an intermediate layer of proteins adsorbed on the material surface. It is known that the density and conformation of these proteins determine cell behaviour. Here we show that the strength of protein/material interactions, which has received very limited attention so far, is key to understand the cellular response to biomaterials. Very strong protein/material interactions reduce the ability of cells to mechanically reorganize proteins at the material interface which results in enhanced matrix degradation, leading ultimately to compromised cell viability. Aim: To develop a nanofiber (NF)-based biomimetic coating on titanium (Ti) that mimics the complex spatiotemporal organization of the extracellular matrix (ECM). Materials & methods: Recombinant cell attachment site (CAS) of fibronectin type III8-10 domain was co-electrospun with polylactic acid (PLA) and covalently bound on polished Ti discs. Osteoblast-like SaOS-2 cells were used to evaluate their complex bioactivity. Results: A significant increase of cell spreading was found on CAS/PLA hybrid NFs, followed by control pure PLA NFs and bare Ti discs. Cell proliferation showed similar trend being about twice higher on CAS/PLA NFs. The significantly increased ALP activity at day 21 indicated an enhanced differentiation of SaOS-2 cells. Conclusion: Coating of Ti implants with hybrid CAS/PLA NFs may improve significantly their osseointegration potential. PIKfyve phosphoinositide kinase produces PtdIns(3,5)P2 and PtdIns5P and governs a myriad of cellular processes including cytoskeleton rearrangements and cell proliferation. The latter entails rigorous investigation since the cytotoxicity of PIKfyve inhibition is a potential therapeutic modality for cancer. Here we report the effects of two PIKfyve-specific inhibitors on the attachment/spreading and viability of mouse embryonic fibroblasts (MEFs) and C2C12 myoblasts. Importantly, 18-h treatment of adherent cells with YM201636 (800 nM) and apilimod (20 nM) in serum-containing culture media did not affect cell viability despite the presence of multiple cytoplasmic vacuoles, a hallmark of PIKfyve inhibition. Strikingly, at the same dose and duration the inhibitors caused excessive cytoplasmic vacuolation, initial suppression of cell attachment/spreading and subsequent marked detachment/death in serum-deprived cells. The remaining adherent cells under serum-deprived conditions had smaller surface area, lacked vinculin/actin-positive focal adhesions and displayed vacuoles occupying the entire cytoplasm. Serum or growth factors protected against PIKfyve inhibitor cytotoxicity. This protection required Akt activation evidenced by the abrogated beneficial effect of serum upon treatment with the clinically-relevant Akt inhibitor MK-2206. Moreover, Akt inhibition triggered cell detachment/death even in serum-fed adherent MEFs treated with apilimod. Intriguingly, BafilomycinA1 (H+-vacuolar ATPase inhibitor), which prevents the cytoplasmic vacuolation under PIKfyve perturbations, rescued all defects in attaching/spreading as well as in adherent cells under serum-starved or serum-fed conditions, respectively. Together, the results indicate that the cytotoxicity of PIKfyve inhibitors in MEFs and C2C12 myoblasts requires Akt suppression and excessive cytoplasmic vacuolation. Mesenchymal stem cells (MSCs) are a promising cell source for cell-based therapies because of their self-renewal and multi-lineage differentiation potential. Unlike embryonic stem cells adult stem cells are subject of aging processes and the concomitant decline in their function. Age-related changes in MSCs have to be well understood in order to develop clinical techniques and therapeutics based on these cells. In this work we have studied the effect of aging on adhesive behaviour of bone marrow-derived MSC and MG- 63 osteoblastic cells onto three extracellular matrix proteins: fibronectin (FN), vitronectin (VN) and collagen I (Coll I). The results revealed substantial differences in adhesive behaviour of both cell types during 21 days in culture. Bone-marrow derived MSCs decreased significantly their adhesive affinity to all studied proteins after 7th day in culture with further incubation. In contrast, MG-63 cells, demonstrated a stable cell adhesive phenotype with high affinity to FN and Coll I and low affinity to vitronectin over the whole culture period. These data suggest that adhesive behaviour of MSCs to matrix proteins is affected by aging processes unlike MG-63 cells and the age-related changes have to be considered when expanding adult stem cells for clinical applications. Stem cells therapy offers a viable alternative for treatment of bone disorders to the conventional bone grafting. However clinical therapies are still hindered by the insufficient knowledge on the conditions that maximize stem cells differentiation. Hereby, we introduce a novel 3D honeycomb architecture scaffold that strongly support osteogenic differentiation of human adipose derived mesenchymal stem cells (ADMSCs). The scaffold is based on electrospun hybrid nanofibers consisting of poly (L-lactide Îµ-caprolactone) and fibrinogen (PLCL/FBG). Classical fibers orientations, random or aligned were also produced and studied for comparison. The overall morphology of ADMSCâ€™s generally followed the nanofibers orientation and dimensionality developing regular focal adhesions and direction-dependent actin cytoskeleton bundles. However, there was an initial tendency for cells rounding on honeycomb scaffolds before ADMSCs formed a distinct bridging network. This specific cells organization appeared to have significant impact on the differentiation potential of ADMSCs towards osteogenic lineage, as indicated by the alkaline phosphatase production, calcium deposition and specific genes expression. Collectively, it was observed synergistic effect of nanofibers with honeycomb architecture on the behavior of ADMSCs entering osteogenic path of differentiation which outlines the potential benefits from insertion of such bioinspired geometrical cues within scaffolds for bone tissue engineering. Novel hybrid, fibrinogen/polylactic acid (FBG/PLA) nanofibers with different configuration (random vs. aligned) and dimensionality (2D vs.3D environment) were used to control the overall behaviour and the osteogenic differentiation of human Adipose Derived Mesenchymal Stem Cells (ADMSCs). Aligned nanofibers in both the 2D and 3D configurations are proved to be favoured for osteo-differentiation. Morphologically we found that on randomly configured nanofibers, the cells developed a stellate-like morphology with multiple projections, however, time-lapse analysis showed significantly diminished cell movements. 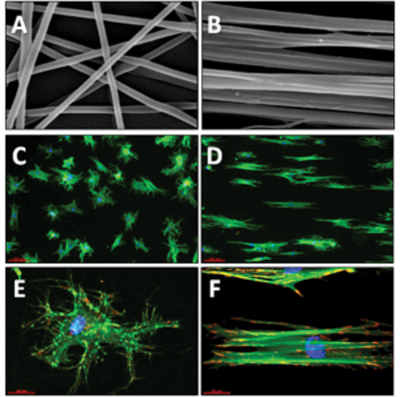 Conversely, an elongated cell shape with advanced cell spreading and extended actin cytoskeleton accompanied with significantly increased cell mobility were observed when cells attached on aligned nanofibers. Moreover, a clear tendency for higher alkaline phosphatase activity was also found on aligned fibres when ADMSCs were switched to osteogenic induction medium. The strongest accumulation of Alizarin red (AR) and von Kossa stain at 21 day of culture in osteogenic medium were found on 3D aligned constructs while the rest showed lower and rather undistinguishable activity. Quantitative reverse transcription-polymerase chain reaction analysis for Osteopontin (OSP) and RUNX 2 generally confirmed this trend showing favourable expression of osteogenic genes activity in 3D environment particularly in aligned configuration. The effect of molecular composition of multilayers, by pairing type I collagen (Col I) with either hyaluronic acid (HA) or chondroitin sulfate (CS) was studied regarding the osteogenic differentiation of adhering human adipose-derived stem cells (hADSCs). Polyelectrolyte multilayer (PEM) formation was based primarily on ion pairing and on additional intrinsic cross-linking through imine bond formation with Col I replacing native by oxidized HA (oHA) or CS (oCS). Significant amounts of Col I fibrils were found on both native and oxidized CS-based PEMs, resulting in higher water contact angles and surface potential under physiological condition, while much less organized Col I was detected in either HA-based multilayers, which were more hydrophilic and negatively charged. An important finding was that hADSCs remodeled Col I at the terminal layers of PEMs by mechanical reorganization and pericellular proteolytic degradation, being more pronounced on CS-based PEMs. This was in accordance with the higher quantity of Col I deposition in this system, accompanied by more cell spreading, focal adhesions (FA) formation and significant Î±2Î²1 integrin recruitment compared to HA-based PEMs. Both CS-based PEMs caused also an increased fibronectin (FN) secretion and cell growth. Furthermore, significant calcium phosphate deposition, enhanced ALP, Col I and Runx2 expression were observed in hADSCs on CS-based PEMs, particularly on oCS-containing one. 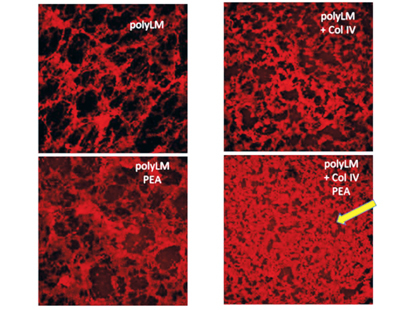 Overall, multilayer composition can be used to direct cell-matrix interactions, and hence stem cell fates showing for the first time that PEMs made of biogenic polyelectrolytes undergo significant remodeling of terminal protein layers, which seems to enable cells to form a more adequate extracellular matrix-like environment. Statement of Significance: Natural polymer derived polyelectrolyte multilayers (PEMs) have been recently applied to adjust biomaterials to meet specific tissue demands. However, the effect of molecular composition of multilayers on both surface properties and cellular response, especially the fate of human adipose derived stem cells (hADSCs) upon osteogenic differentiation has not been studied extensively, yet. In addition, no studies exist that investigate a potential cell-dependent remodeling of PEMs made of extracellular matrix (ECM) components like collagens and glycosaminoglycans (GAGs). Furthermore, there is no knowledge whether the ability of cells to remodel PEM components may provide an added value regarding cell growth and differentiation. Finally, it has not been explored yet, how intrinsic cross-linking of ECM derived polyelectrolytes that improve the stability of PEMs will affect the differentiation potential of hADSCs. The current work aims to address these questions and found that the type of GAG has a strong effect on properties of multilayers and osteogenic differentiation of hADSCs. Additionally, we also show for the first time that PEMs made of biogenic polyelectrolytes undergo significant remodeling of terminal layers as completely new finding, which allows cells to form an ECM-like environment supporting differentiation upon osteogenic lineage. 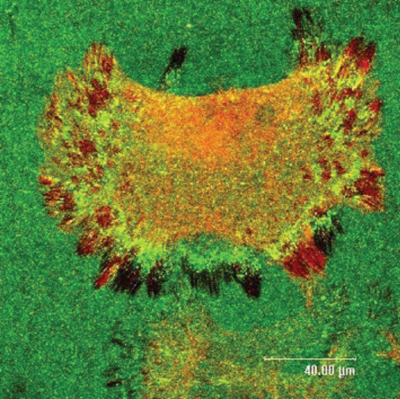 The finding of this work may open new avenues of application of PEM systems made by layer by layer (LbL) technique in tissue engineering and regenerative medicine. Mimicking the complex intricacies of the extra cellular matrix including 3D configurations and aligned fibrous structures were traditionally perused for producing cartilage tissue from stem cells. This study shows that human adipose derived mesenchymal stem cells (hADMSCs) establishes significant chondrogenic differentiation and may generate quality cartilage when cultured on 2D and randomly oriented fibrinogen/poly-lactic acid nanofibers compared to 3D sandwich-like environments. The adhering cells show well-developed focal adhesion complexes and actin cytoskeleton arrangements confirming the proper cellular interaction with either random or aligned nanofibers. However, quantitative reverse transcription-polymerase chain reaction analysis for Collagen 2 and Collagen 10 genes expression confirms favorable chondrogenic response of hADMSCs on random nanofibers and shows substantially higher efficacy of their differentiation in 2D configuration versus 3D constructs. These findings introduce a new direction for cartilage tissue engineering through providing a simple platform for the routine generation of transplantable stem cells derived articular cartilage replacement that might improve joint function. Abstract Vascular basement membrane remodeling involves assembly and degradation of its main constituents, type IV collagen (Col IV) and laminin, which is critical during development, angiogenesis, and tissue repair. Remodeling can also occur at cellâ€“biomaterials interface altering significantly the biocompatibility of implants. Here we describe the fate of adsorbed Col IV in contact with endothelial cells adhering on positively charged NH2 or hydrophobic CH3 substrata, both based on self-assembly monolayers (SAMs) and studied alone or mixed in different proportions. AFM studies revealed distinct pattern of adsorbed Col IV, varying from single molecular deposition on pure NH2 to network-like assembly on mixed SAMs, turning to big globular aggregates on bare CH3. Human umbilical endothelial cells (HUVECs) interact better with Col IV adsorbed as single molecules on NH2 surface and readily rearrange it in fibril-like pattern that coincide with secreted fibronectin fibrils. The cells show flattened morphology and well-developed focal adhesion complexes that are rich on phosphorylated FAK while expressing markedly low pericellular proteolytic activity. Conversely, on hydrophobic CH3 substrata HUVECs showed abrogated spreading and FAK phosphorylation, combined with less reorganization of the aggregated Col IV and significantly increased proteolytic activity. The later involves both MMP-2 and MMP-9, as measured by zymography and FITC-Col IV release. The mixed SAMs support intermediate remodeling activity. Taken together these results show that chemical functionalization combined with Col IV preadsorption provides a tool for guiding the endothelial cells behavior and pericellular proteolytic activity, events that strongly affect the fate of cardiovascular implants. Considering that vitronectin (VN) can promote both cell adhesion and matrix degradation, it is likely to play a dual role at the cell-biomaterial interface. In this paper we therefore describe details of the dynamic interplay between matrix adhesion and pericellular proteolysis in endothelial cells adhered to glass model substratum. Initially we show that coating concentration determines protein organization at the surface. When the protein coating density approached saturation (63 ng cm?2), VN spontaneously organized itself in multimeric aggregates at the surface (30?50 nm in diameter). At subsaturation protein density (17 ng cm?2) VN molecules were present predominantly as single entities, indicating that a minimum coating density was required for VN multimerization. By fluorescent visualization of surface-associated VN in different ways, we provide the first evidence of significant proteolytic remodelling of VN by endothelial cells (HUVECs) at the sites of Î±v integrin clusters. The degree of proteolysis was estimated using a novel approach relying on dequenching of FITC-labeled VN upon proteolytic activity, showing that about one-third of the surface-associated VN was proteolytically altered by adhering HUVECs. In addition, we demonstrate that HUVECs can internalize surface-associated VN and deposit it in a linear pattern along longitudinal actin filaments. Deposited VN was partly colocalized with urokinase receptors. Taken altogether, we elucidate the complex and dynamic behavior of VN during initial cell?biomaterials interactions, the equilibrium if which could have a significant impact on the biocompatibility of any blood contacting implants. Considering that vitronectin (VN) can promote both cell adhesion and matrix degradation, it is likely to play a dual role at the cell-biomaterial interface. In this paper we therefore describe details of the dynamic interplay between matrix adhesion and pericellular proteolysis in endothelial cells adhered to glass model substratum. Initially we show that coating concentration determines protein organization at the surface. When the protein coating density approached saturation (63 ng cm?2), VN spontaneously organized itself in multimeric aggregates at the surface (30?50 nm in diameter). At subsaturation protein density (17 ng cm?2) VN molecules were present predominantly as single entities, indicating that a minimum coating density was required for VN multimerization. By fluorescent visualization of surface-associated VN in different ways, we provide the first evidence of significant proteolytic remodelling of VN by endothelial cells (HUVECs) at the sites of Î±v integrin clusters. The degree of proteolysis was estimated using a novel approach relying on dequenching of FITC-labeled VN upon proteolytic activity, showing that about one-third of the surface-associated VN was proteolytically altered by adhering HUVECs. In addition, we demonstrate that HUVECs can internalize surface-associated VN and deposit it in a linear pattern along longitudinal actin filaments. Deposited VN was partly colocalized with urokinase receptors. Taken altogether, we elucidate the complex and dynamic behavior of VN during initial cell?biomaterials interactions, the equilibrium if which could have a significant impact on the biocompatibility of any blood contacting implants. Electrospun nanofibrous materials mimicking the architecture of native extracellular matrix (ECM) hold great promise as scaffolds in tissue engineering. In order to optimize the properties of nanofibrous scaffolds it is important to understand the impact of fibresâ€™ organization on cell behaviour. Herein, we investigated the effect of nanofibres (NFs) alignment on human adipose-derived mesenchymal stem cells (hAD-MSCs) adhesion and morphology. Electrospun composite fibrinogen/poly-lactic acid (FNG/PLA) NF scaffolds with same composition and comparable fibre size were fabricated into randomly oriented and aligned configuration and stem cells adhesion was characterized by the meaning of overall cell morphology, actin cytoskeleton organization and expression of molecules, involved in the development of focal adhesion complexes. We found that hAD-MSCs altered their morphology, actin cytoskeleton and cell attachment in accordance with nanofibre orientation while cell spreading, focal adhesions and expression of Î²1 and Î±Nintegrin receptors were not influenced significantly by fibre orientation. These results confirmed that fibre alignment of scaffold guide cellular arrangement and could be beneficial for stem differentiation and therefore for the successful scaffolds development if its contact guidance coincided with the cell shape and cytoskeletal tension. The ability of polymers to span wide ranges of mechanical properties and morph into desired shapes makes them useful for a variety of applications, including scaffolds, self-assembling materials, and nanomedicines. With an interdisciplinary list of subjects and contributors, this book overviews the biomedical applications of polymers and focuses on the aspect of regenerative medicine. Chapters also cover fundamentals, theories, and tools for scientists to apply polymers in the following ways: Matrix protein interactions with synthetic surfaces Methods and materials for cell scaffolds Complex cell-materials microenvironments in bioreactors Polymer therapeutics as nano-sized medicines for tissue repair Functionalized mesoporous materials for controlled delivery Nucleic acid delivery nanocarriers Concepts include macro and nano requirements for polymers as well as future perspectives, trends, and challenges in the field. From self-assembling peptides to self-curing systems, this book presents the full therapeutic potential of novel polymeric systems and topics that are in the leading edge of technology. 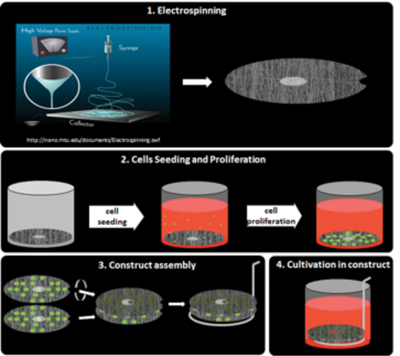 Developing appropriate cell culturing techniques to populate scaffolds has become a great challenge in tissue engineering. This work describes the use of spinner flask dynamic cell cultures to populate hydroxyapatite microcarriers for bone tissue engineering. The microcarriers were obtained through the emulsion of a self-setting aqueous Î±-tricalcium phosphate slurry in oil. After setting, hydroxyapatite microcarriers were obtained. The incorporation of gelatin in the liquid phase of the Î±-tricalcium phosphate slurry allowed obtaining hybrid gelatin/hydroxyapatite-microcarriers. Initial cell attachment on the microcarriers was strongly influenced by the speed of the dynamic culture, achieving higher attachment at low speed (40 r/min) as compared to high speed (80 r/min). Under moderate culture speeds (40 r/min), the number of cells present in the culture as well as the number of microcarrier-containing cells considerably increased after 3 days, particularly in the gelatin-containing microcarriers. At longer culture times in dynamic culture, hydroxyapatite-containing microcarriers formed aggregates containing viable and extracellular matrix proteins, with a significantly higher number of cells compared to static cultures. This paper describes the biological consequences of presenting electrospun fibrinogen (FBG) to endothelial cells as a spatially organized nanofibrous matrix. Aligned and randomly oriented FBG nanofibers with an average diameter of less than 200 nm were obtained by electrospinning of native FBG solution. Electrophoretic profiling confirmed that the electrospun FBG resembled the native protein structure, and fluorescent tracing of FITC-labeled FBG showed that electrospun fibers withstood immersion in physiological solutions reasonably well for several days. With respect to cellular interactions, the nanofibrous FBG matrix provided better conditions for initial recognition by human umbilical vein endothelial cells compared to pre-adsorbed FBG on a flat surface. Furthermore, the spatial organization of electrospun FBG fibers presented opportunities for guiding the cellular behavior in a way that is not possible when the protein is presented in another form (e.g. adsorbed or soluble). For example, on aligned FBG fibers, cells rapidly oriented themselves along the fibers, and time-lapse recordings revealed pronounced cellular movements restricted to the fiber direction. In great contrast, on randomly deposited fibers, cells acquired a stellate-like morphology and became locally immobilized by the fibers. We also show that the FBG fiber orientation significantly influenced both the cytoskeleton organization in confluent cell layers and the orientation of the extracellular fibronectin matrix secreted by the cells. In conclusion, this study demonstrates that electrospun FBG nanofibers can be a promising tool for guiding endothelial cell behavior for tissue engineering applications. This paper describes the fate of adsorbed type IV collagen (Col IV) in contact with fibroblasts on model biomaterial surfaces, varying in wettability, chemistry and charge. We found that fibroblasts not only interact but also tend to remodel differently adsorbed Col IV employing two distinct mechanisms: mechanical reorganization and proteolytic degradation. Apart from the trend of adsorption -NH2 > CH3 > COOH > OH- the cells interact better with NH2 and OH surfaces - i.e. independently of the amount of adsorbed Col IV - evident from the quantitative measurements of cell adhesion and spreading and the improved recruitment of alpha 1 and alpha 2 integrins as well as p-FAK in focal adhesions. The linearly arranged Col IV co-localize with FN fibrils formed from either secreted, or exogenously added protein, which confirms their interdependence during a reorganization process. We further found that this reorganization is better pronounced on hydrophilic OH and positively charged NH2 surfaces correlating with the improved cellular interaction. Conversely, the fibroblasts tend to round on COOH and CH3 surfaces in compliance with the altered integrin signaling and also the increased pericellular proteolysis activity quantified by the increased de-quenching of adsorbed FITC-Col IV and zymography. Taken together, these results show that remodeling of Col IV at a cell-biomaterial interface depends strongly on the surface properties of a material and affects significantly its biological performance. In this study, we propose a methodology to obtain a family of biomimetic substrates with a hierarchical rough topography at the micro and nanoscale that span the entire range of wettability, from the superhydrophobic to the superhydrophilic regime, through an Ar-plasma treatment at increasing durations. Moreover, we employ the same approach to produce a superhydrophobic-to- superhydrophilic surface gradient along centimetre-length scale distances within the same sample. We characterize the biological activity of these surfaces in terms of protein adsorption and cell response, using fibronectin, a major component of the extracellular matrix, and C2C12 cells, a myoblast cell line. Fibronectin conformation, assessed via binding of the monoclonal antibody HFN7.1, exhibits a non-monotonic dependence on surface wettability, with higher activity on hydrophilic substrates (WCA = 38.6 Â± 8.1Â°). On the other hand, the exposition of cell-binding epitopes is diminished on the surfaces with extreme wetting properties, the conformation being particularly altered on the superhydrophobic substrate. The assessment of cell response via the myogenic differentiation process reveals that a gradient surface promotes a different response with respect to cells cultured on discrete uniform samples: even though in both cases the same non-monotonic differentiation pattern is found, the differential response to the various wettabilities is enhanced along the gradient while the overall levels of differentiation are diminished. On a gradient surface cells are in fact exposed to a range of continuously changing stimuli that foster cell migration and detain the differentiation process. Protein remodeling at the cell–material interface is an important phenomenon that should be incorporated into the design of advanced biomaterials for tissue engineering. In this work, we address the relationship between fibronectin (FN) activity at the material interface and remodeling, including proteolytic cascades. To do so, we studied FN adsorption on two chemically similar substrates, poly(ethyl acrylate) (PEA) and poly(methyl acrylate) (PMA), which resulted in different distribution and conformation of the protein at the material interface: FN organized spontaneously upon adsorption on PEA into physiological-like fibrils, through a process called material-driven FN fibrillogenesis. The amount of adsorbed FN and its conformation were investigated in two different coating concentrations (2 and 20 μg/mL). Since FN activity at the material interface determines the initial cellular response, we followed the formation of focal adhesions (vinculin) and subsequent cell signaling by focal adhesion kinase (FAK) expression and its phosphorylation (pFAK). More detailed studies were performed to get further insights into integrin binding by crosslinking and extraction followed by immunofluorescence, as well as protein and gene expression for α5 and αv. To correlate cell adhesion with matrix degradation, gene expression and activity (zymography) of matrix metalloproteinases (MMPs) were measured. Overall, we demonstrated that the material-driven FN fibrillogenesis triggers proteolytic activity: MMP activity was higher on the material-driven FN fibrils, as a compensatory mechanism to the inability of cells to reorganize this FN network. Novel hydroxyapatite (HA)-collagen microcarriers (MCs) with different micro/nanostructures were developed for bone tissue-engineering applications. The MCs were fabricated via calcium phosphate cement (CPC) emulsion in oil. Collagen incorporation in the liquid phase of the CPC resulted in higher MC sphericity. The MCs consisted of a porous network of entangled hydroxyapatite crystals, formed as a result of the CPC setting reaction. The addition of collagen to the MCs, even in an amount as small as 0.8wt%, resulted in an improved interaction with osteoblast-like Saos-2 cells. The micro/nanostructure and the surface texture of the MCs were further tailored by modifying the initial particle size of the CPC. A synergistic effect between the presence of collagen and the nanosized HA crystals was found, resulting in significantly enhanced alkaline phosphatase activity on the collagen-containing nanosized HA MCs. Cells assemble fibronectin (FN) into fibrils in a process mediated by integrins. For this process to occur, it is known that the presence of other serum proteins is necessary. However, the individual effect of these proteins on FN fibrillogenesis has not been addressed so far. In this study, the effect of vitronectin (VN), an ECM adhesion protein, on material-driven FN fibrillogenesis and cell-mediated FN reorganization is investigated. Poly(ethyl acrylate), PEA, which has previously shown the ability to induce the organization of FN into well-developed physiological-like networks upon adsorption, was employed as a material substrate. FN adsorption, cell adhesion and cellular FN reorganization in the presence or absence of VN were studied. Both FN surface density, quantified via western blot, and its distribution on PEA surfaces, determined via atomic force microscopy, were altered when FN was adsorbed competitively with VN at certain compositions. Moreover, the presence of VN on the material surfaces enhanced cell-mediated FN reorganization and secretion, in comparison with the process which took place in the presence of serum proteins. Plasma polymerization was used to produce novel nanometric coatings able to direct fibronectin adsorption and cell response. Using ethyl acrylate as a monomer, we obtain coatings whose chemical composition maintains some of the characteristic functionalities of the photo-initiated polymer, while the water contact angle increases monotonically with the duration of the plasma discharge. Enhanced surface mobility of the polymer chains due to a decrease of the thickness of the coating justifies this increase in wettability at lower treatment times. The coatings with higher surface mobility are shown to promote a more active conformation of the adsorbed protein, as proved by binding of the monoclonal antibodies HFN7.1 and mAb1937. Culture of MC3T3-E1 osteoblast-like cells onto the fibronectin-coated substrates further proves that the more mobile surfaces support better initial cell adhesion, even at low fibronectin surface density, as well as stronger cell-mediated fibronectin reorganization. Hydroxyapatite (HA) is the main component of human bones, a highly bioactive and biocompatible material; however, it has poor mechanical properties. Carbon-based coatings are found to significantly improve the mechanical properties of apatite, increase its adhesion, prevent metal ion release from metal implants and inhibit the formation of fibrous tissue and blood clotting upon implantation. In this chapter, homogeneous nanodiamond-reinforced hydroxyapatite (HA-ND) composite coating with improved mechanical strength and ductility was developed to enhance the biological properties of deposited by electrodeposition from simulated body fluid with dispersed nanodiamond particles. Study of the initial interaction of osteoblast-like MG-63 cells revealed that cells attached well on all plain samples (HA-ND, pure HA and stainless steel). However, precoating with fibronectin (FN) even at low adsorption concentrations (1mg/ml) strongly improved cell adhesion and preferentially spreading on the HA-ND samples as indicated by the flattened cell morphology and pronounced vinculin positive focal adhesions. This effect correlates with the observed higher affinity for FN. Moreover, osteoblasts tended to rearrange both adsorbed and secreted FN in a fibril-like pattern, suggesting improved FN matrix organization on HA-ND samples. Considering the structural role of type IV collagen (Col IV) in the assembly of the basement membrane (BM) and the perspective of mimicking its organization for vascular tissue engineering purposes, we studied the adsorption pattern of this protein on model hydrophilic (clean glass) and hydrophobic trichloro(octadecyl) silane (ODS) surfaces known to strongly affect the behavior of other matrix proteins. The amount of fluorescently labeled Col IV was quantified showing saturation of the surface for concentration of the adsorbing solution of about 50 mu g/ml, but with approximately twice more adsorbed protein on ODS. AFM studies revealed a fine-nearly single molecular size-network arrangement of Col IV on hydrophilic glass, which turns into a prominent and growing polygonal network consisting of molecular aggregates on hydrophobic ODS. The protein layer forms within minutes in a concentration-dependent manner. We further found that human umbilical vein endothelial cells (HUVEC) attach less efficiently to the aggregated Col IV (on ODS), as judged by the significantly altered cell spreading, focal adhesions formation and the development of actin cytoskeleton. Conversely, the immunofluorescence studies for integrins revealed that the fine Col IV network formed on hydrophilic substrata is better recognized by the cells via both alpha 1 and alpha 2 heterodimers which support cellular interaction, apart from these on hydrophobic ODS where almost no clustering of integrins was observed. Vitronectin (VN) adsorption on a family of model substrates consisting of copolymers of ethyl acrylate and hydroxyl ethylacrylate in different ratios (to obtain a controlled surface density of -OH groups) was investigated by Atomic Force Microscopy (AFM). It is shown that the fraction of the substrate covered by the protein depends strongly on the amount of hydroxyl groups in the sample and it monotonically decreases as the -OH density increases. Isolated globular-like VN molecules are observed on the surfaces with the higher OH density. As the fraction of hydroxyl groups decreases, aggregates of 3-5 VN molecules are observed on the sample. Overall cell morphology, focal adhesion formation and actin cytoskeleton development are investigated to assess the biological activity of the adsorbed VN on the different surfaces. Dermal fibroblast cells show excellent material interaction on the more hydrophobic samples (OH contents lower than 0.5), which reveals enhanced VN activity on this family of substrates as compared with other extracellular matrix proteins (e.g., fibronectin and fibrinogen). Understanding the relationships between material surface properties, behaviour of adsorbed proteins and cellular responses is essential to design optimal material surfaces for tissue engineering. In this study we modify thin layers of plasma polymerized hexamethyldisiloxane (PPHMDS) by ammonia treatment in order to increase surface wettability and the corresponding biological response. The physico-chemical properties of the polymer films were characterized by contact angle (CA) measurements and Fourier Transform Infrared Spectroscopy (FTIR) analysis.Human umbilical vein endothelial cells (HUVEC) were used as model system for the initial biocompatibility studies following their behavior upon preadsorption of polymer films with three adhesive proteins: fibronectin (FN), fibrinogen (FG) and vitronectin (VN). Adhesive interaction of HUVEC was evaluated after 2 hours by analyzing the overall cell morphology, and the organization of focal adhesion contacts and actin cytoskeleton. We have found similar good cellular response on FN and FG coated polymer films, with better pronounced vinculin expression on FN samples while. Conversely, on VN coated surfaces the wettability influenced significantly initial celular interaction spreading. The results obtained suggested that ammonia plasma treatment can modulate the biological activity of the adsorbed protein s on PPHMDS surfaces and thus to influence the interaction with endothelial cells. The present study reports on how detonation nanodiamond (DND) - plasma poly(hexamethyldisiloxane) composites (PPHMDS) affect osteoblast cell behavior. It has been established that various modified DND nanoparticles (Ag-DND and Si-DND) can be readily integrated into virtually all polymer matrices. In particular, PPHDMS composites have been developed over the past few years because of the variety of their application as medical devices and implants. By incubation of MG-63 osteoblast-like cells on the surface of DND (Ag-DND and Si-DND) - PPHMDS composite, we tested the hypothesis that DND-based polymer composites can influence the adhesion behavior of MG-63 osteoblast-like cells. Morphological and structural characterization of DND, Ag-DND and Si-DND powders was carried out by XRD, HRTEM and EDS. For the study of the composite layers, deposited on cover glass (CG), FTIR spectroscopy has been performed in order to determine if the DND nanofiller can potentially modify the structural and chemical dynamics of the polymer matrix. The kinetic of static water contact angle of composite surfaces as a function of the as-used nanofiller DND's in polymer matrix was measured The results with MG-63 osteoblast-like cells suggest the potential of using DND-based polymer composites for application in engineering implantable scaffolds and devices. Fibronectin (FN) fibrillogenesis is a cell-mediated process involving integrin activation that results in conformational changes of FN molecules and the organization of actin cytoskeleton. A similar process can be induced by some chemistries in the absence of cells, e.g., poly(ethyl acrylate) (PEA), which enhance FN-FN interactions leading to the formation of a biologically active network. Atomic force microscopy images of single FN molecules, at the early stages of adsorption on plane PEA, allow one to rationalize the process. Further, the role of the spatial organization of the FN network on the cellular response is investigated through its adsorption on electrospun fibers. Randomly oriented and aligned PEA fibers were prepared to mimic the three-dimensional organization of the extracellular matrix. The formation of the FN network on the PEA fibers but not on the supporting coverglass was confirmed. Fibroblasts aligned with oriented fibers, displayed extended morphology, developed linearly organized focal adhesion complexes, and matured actin filaments. Conversely, on random PEA fibers, cells acquired polygonal morphology with altered actin cytoskeleton but well-developed focal adhesions. Late FN matrix formation was also influenced: spatially organized FN matrix fibrils along the oriented PEA fibers and an altered arrangement on random ones. It was found previously that membranes based on co-polymers of acrylonitrile (AN) and 2-acrylamido-2-methyl-propansulfonic acid (AMPS) greatly stimulated the functionality and survival of primary hepatocytes. In those studies, however, the pure AN-AMPS co-polymer had poor membrane-forming properties, resulting in quite dense rubber-like membranes. Hence, membranes with required permeability and optimal biocompatibility were obtained by blending the AN-AMPS co-polymer with poly(acrylonitrile) homopolymer (PAN). The amount of PAN (P) and AN-AMPS (A) in the blend was varied from pure PAN (P/A-100/0) over P/A-75/25 and P/A-50/50 to pure AN-AMPS co-polymer (P/A-0/100). A gradual decrease of molecular cut-off of membranes with increase of AMPS concentration was found, which allows tailoring membrane permeability as necessary. C3A hepatoblastoma cells were applied as a widely accepted cellular model for assessment of hepatocyte behaviour by attachment, viability, growth and metabolic activity. It was found that the blend P/A-50/50, which possessed an optimal permeability for biohybrid liver systems, supported also the attachment, growth and function of C3A cells in terms of fibronectin synthesis and P-450 isoenzyme activity. Hence, blend membranes based on a one to one mixture of PAN and AN-AMPS combine sufficient permeability with the desired cellular compatibility for application in bioreactors for liver replacement. The influence of surface chemistry -substrates with controlled surface density of -OH groups- on fibronectin conformation and distribution is directly observed by Atomic Force Microscopy (AFM). FN fibrillogenesis, which is known to be a process triggered by interaction with integrins, is shown in our case to be induced by the substrate (in absence of cells), which is able to enhance FN-FN interactions leading to the formation of a protein network on the material surface. This phenomenon depends both on surface chemistry and protein concentration. The level of the FN fibrillogenesis was quantified by calculating the fractal dimension of the adsorbed protein from image analysis of the AFM results. The total amount of adsorbed FN is obtained by making use of a methodology which employs western-blotting combined with image analysis of the corresponding protein bands, with the lowest sensitivity threshold equal to 15 ng of adsorbed protein. Furthermore, FN adsorption is correlated to human osteoblast adhesion through morphology and actin cytoskeleton formation. Actin polymerization is in need of the formation of the protein network on the substrate's surface. Cell morphology is more rounded (as quantified by calculating the circularity of the cells by image analysis) the lower the degree of FN fibrillogenesis on the substrate. Here, the layer-by-layer technique (LbL) was used to modify glass as model biomaterial with multilayers of chitosan and heparin to control the interaction with MG-63 osteoblast-like cells. Different pH values during multilayer formation were applied to control their physico-chemical properties. In the absence of adhesive proteins like plasma fibronectin (pFN) both plain layers were rather cytophobic. Hence, the preadsorption of pFN was used to enhance cell adhesion which was strongly dependent on pH. Comparing the adhesion promoting effects of pFN with an engineered repeat of the FN III fragment and collagen I which both lack a heparin binding domain it was found that multilayers could bind pFN specifically because only this protein was capable of promoting cell adhesion. Multilayer surfaces that inhibited MG-63 adhesion did also cause a decreased cell growth in the presence of serum, while an enhanced adhesion of cells was connected to an improved cell growth. A series of co-culture experiments between fibroblasts and H-460 human lung carcinoma cells were performed to learn more about the fate of adsorbed type IV collagen (Coll IV). Fibroblasts were able to spatially rearrange Coll IV in a specific linear pattern, similar but not identical to the fibronectin (FN) fibrils. Coll IV partly co-aligns with fibroblast actin cytoskeleton and transiently co-localize with FN, as well as with beta 1 and a 2 integrin clusters, suggesting a cell-dependent process. We further found that this Coll IV reorganization is suppressed in contact with H460 cells. Zymography revealed strongly elevated MMP-2 activity in supernatants of co-cultures, but no activity when fibroblasts or cancer cells were cultured alone. Thus, we provide evidence that reorganization of substrate associated Coll IV is a useful morphological approach for in vitro studies on matrix remodeling activity during tumorigenesis. A biomimetic bone-like composite, made of self-assembled collagen fibrils and carbonate hydroxyapatite nanocrystals, has been performed by an electrochemically-assisted deposition on titanium plate. The electrolytic processes have been carried out using a single type I collagen molecules suspension in a diluted Ca(NO3)(2) and NH4H2PO4 solution at room temperature and applying a constant current for different periods of time. Using the same electrochemical conditions, carbonate hydroxyapatite nanocrystals or reconstituted collagen. brils coatings were obtained. The reconstituted collagen. brils, hydroxyapatite nanocrystals and collagen fibrils/apatite nanocrystals coatings have been characterized chemically, structurally and morphologically, as well as for their ability to bind fibronectin (FN). Fourier Transform Infrared microscopy has been used to map the topographic distribution of the coating components at different times of electrochemical deposition, allowing to single out the individual deposition steps. Moreover, roughness of Ti plate has been found to affect appreciably the nucleation region of the inorganic nanocrystals. Laser scanning confocal microscopy has been used to characterize the FN adsorption pattern on a synthetic biomimetic apatitic phase, which exhibits a higher affinity when it is inter-grown with the collagen fibrils. The results offer auspicious applications in the preparation of medical devices such as biomimetic bone-like composite-coated metallic implants.